When someone talks about German Pen Makers nobody can ignore or not talk about KaWeCo. They were the first company to get the safety fountain pens patented in 1908. You can see more about the history of Kaweco here: Link. There was a time when I badly wanted Kaweco Pens and there was no source to get them in India. But now they are sold in India by a Distributor. At the moment I have almost 7 to 8 nos. of the Kaweco Sports Pen and I love them so much that you can find me carrying the Kaweco Sport at least 8 out of 10 times. And now I wanted to step up to next level and thus the Kaweco Student. Therefore this review is related to Kaweco Student and this pen was offered to me at free of cost by Kaweco India for Review and Giveaway Purpose. Giveaway of this pen will start next week. So keep an eye on the blog. The pen is really beautiful at first glance due to its classic colors. The pen comes in lovely Classic Blue, Classic Green, Classic Red and Black and White Color and there seems to be a demonstrator version for the same also. 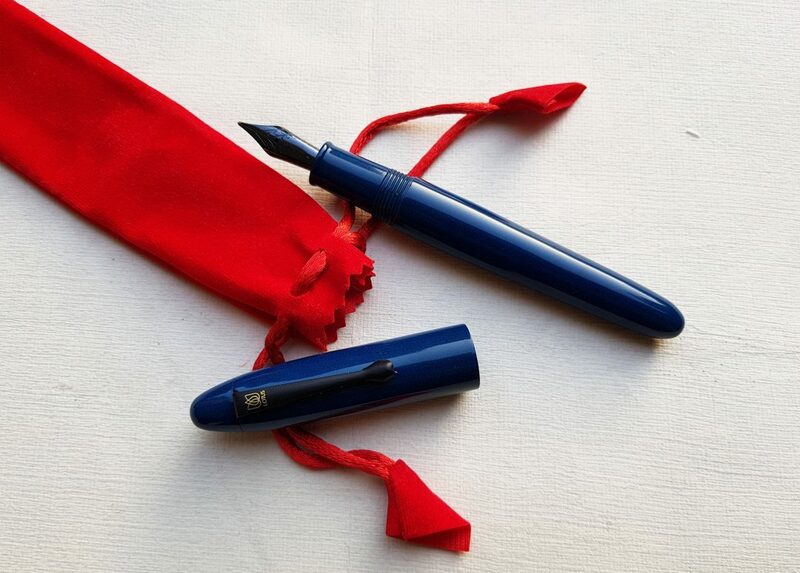 I got the red version with the fine nib for the review purpose. Actually, the colors are not that bright or blingy and these colors are soothing to eyes and are actually quite subtle. The trims on the pen are in silver finish and match the color of the nib. The grip section is made of metal in is in slick chrome finish just like the Lamy Studio but to my surprise, this was quite better and I actually felt comfortable to write with. The reason could be due to the concave shape of grip section. Above are the images showing the pic of the pen when capped and uncapped. The pen is standard regular size pen. The barrel is thickest at the center and tapers slowly towards the bottom to a flat end where edges are rounded. Below is the comparative picture of the pen with cap and without a cap in hand. The cap of the pen has medallion at the top which says ‘KaWeCo’ in retro style. What I like most about the cap was the clip which was built in quite sturdy and stiff and has a retro, classical look to it. The cap top is slightly peaked at the center. The cap also has a wide single center band just above the bottom of the cap and has “Kaweco Germany” engraved on it. There is also laser printing of the pen model name just behind the clip side which reads “Kaweco Student” in a first line and “Germany” in the second line. The top end of the pen is slightly peaked in a conical shape as mentioned earlier but the bottom end is flat with round edges. The bottom end also has a small depression in the center. Overall it’s a well-designed pen and especially the play of colors those retro looking classic solid colors. I have deducted half in rating only for the slick metal section which generally I don’t like but here I can live with it whereas with Lamy studio it’s a strict no-no. Unlike Kaweco Sports the material used here is 1000 times better be it resin or metal section or even the plating on the clip or medallion. The trims are also top notch and have clear engraving on the pen. The resin material used is also thicker and thus making it quite sturdier. The pen material, color, and even the finish were top notch. And to top it off the pen comes in an amazing tin box which adds to the wow factor. The pen is front heavy due to metal section but when you post the cap the weight is distributed evenly in the center, thus negating the heaviness of metal section. Though I did not find any trouble writing with pen posted or not. The cap posts securely at back. Though the shape of section results in the firm grip but at the same time I found the section too thin and this might trouble people with big large hands but certainly not me. The pen is actually lighter compared to my large sized ASA TransNauka capped but uncapped it is just a tad heavier. As visible from above images the pen is smaller than the standard sized TWSBI Classic but at the same time, it can take one full-size converter. The nib is a fine steel nib which is supplied by bock and is the same size as what is supplied on the Kaweco Sports. The nib was fine and had no scratchiness associated with it. However, it has flow issues. I checked and it was not the baby bottom issue which is the most common feature of Kaweco B or BB nibs but certainly not F nib.But this pen has consistent flow issues and I hated that. The pen had finned plastic feed and had no obstruction in ink channel. Later I found out that the issue was related to the converter. Advice: Do Buy from the source which gives you replacement warranty. So that you can change if you want the replacement. The ink can be used via cartridge or converter mechanism. It can take full size converter long cartridge or otherwise you cacn use one small cartridge and keep extra inside the barrel. Now the problem I faced with the pen related to ink flow can be attributed to the fact that ink remained stuck to the side walls of the converter and did not come down easily and thus keeping a consistent supply to nib unit. I was not happy with ink flow issues early but that got sorted when I used the converter. The pen retails around 4500 in India and you can easily get 25 to 30 % discount on these prices. Classic Retro looking pen recommended to people with small hands and those who want full sized Kaweco Pen. Thanks for the review Vaibhav. I read the review and ordered one for myself and am very happy with the pen. Is the giveaway of Student over ? I have black Student with Medium tip, its wonderful. Your review of nib is an eye opener for me. Thanks …so the chapter is still open ! Been a fountain pen lover since childhood. But never saw a platform for fp. Keep reviewing. It will be a great learning for us. Thank you. Indeed an indepth review. love your photography skills,, will be looking for the giveaway!! A very thorough and informative review. I enjoy the outdoor photography too. Great review! Love how many good photos you have.